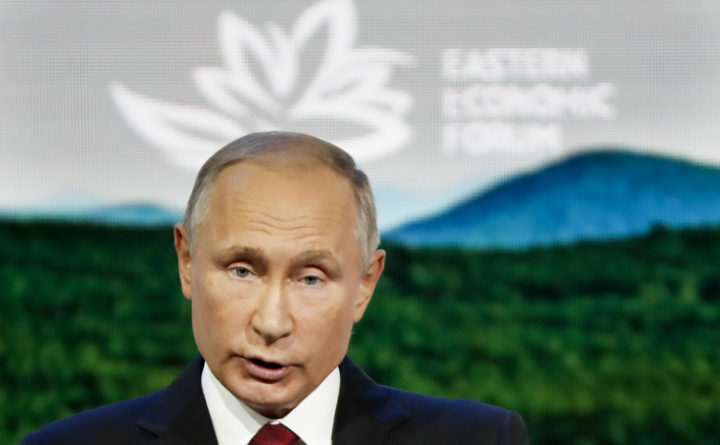 Russian President Vladimir Putin gestures as delivers a speech Wednesday during a plenary session at the Eastern Economic Forum in Vladivostok, Russia. MOSCOW — Russian President Vladimir Putin said Wednesday that his government knows the identity of the men accused by Britain of trying to murder a former Russian spy, and they are not criminals. British prosecutors last week charged in absentia two men they identified as Alexander Petrov and Ruslan Boshirov for using a military grade nerve agent in Britain against Sergei Skripal and his daughter, Yulia. “We know who they are, we found them. There is nothing criminal about them. They are just ordinary civilians,” Putin told a session at an economic forum in Vladivostok broadcast on state TV. Russia had previously said the names given to them by British prosecutors were meaningless. British Prime Minister Theresa May squarely blamed Russia’s military intelligence service on Sept. 5 for carrying out the attack, adding that the upper echelons of the Russian state could also have been involved. Britain says the two men flew from Moscow to London in early March, from where they traveled to Salisbury in England and attempted to kill the Skripals. Police posted detailed surveillance camera images tracking the two men moving through crowded British transport hubs, allegedly carrying the military-grade poison. A 44-year-old British national, Dawn Sturgess, died in July from exposure to what police say was the same nerve agent that afflicted the Skripals, in a town just north of Salisbury. The elder Skripal, who was a Russian intelligence agent who switched sides, as well as his daughter, survived the poisoning and now live in an undisclosed location. Russia has consistently denied any role in either incident. Britain’s allies have backed it over the case, with the United States and other European countries expelling hundreds of Russian diplomats suspected of being spies. Following the latest revelations, France, Germany, Canada and the United States endorsed Britain’s assessment that Russian military officers were involved and urged Russia to provide “full disclosure” of its Novichok nerve-agent program.